Life may not begin at (nearly) sixty but it certainly takes some unexpected turns for golden girls Vivian and Edge, fellow residents at the Grasshopper Lawns Retirement Village in Scotland, after the murder of an unpopular resident. Edge’s niece is a sergeant in the small local police force, so they are not only kept up to date, they start picking up clues that no-one is passing on to the police. The murder sparks off a lively investigation, friendships with bon vivant William (a vast and charming SF writer) and sardonic new neighbour Donald, and will be enjoyed by armchair detectives everywhere. 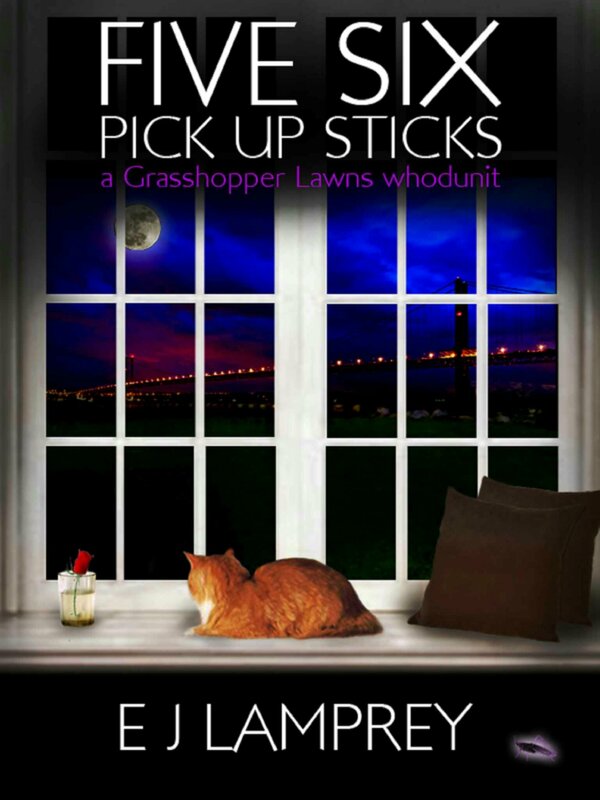 This is the first in a cosy whodunit series set in the beautiful Firth of Forth area just north of Edinburgh. 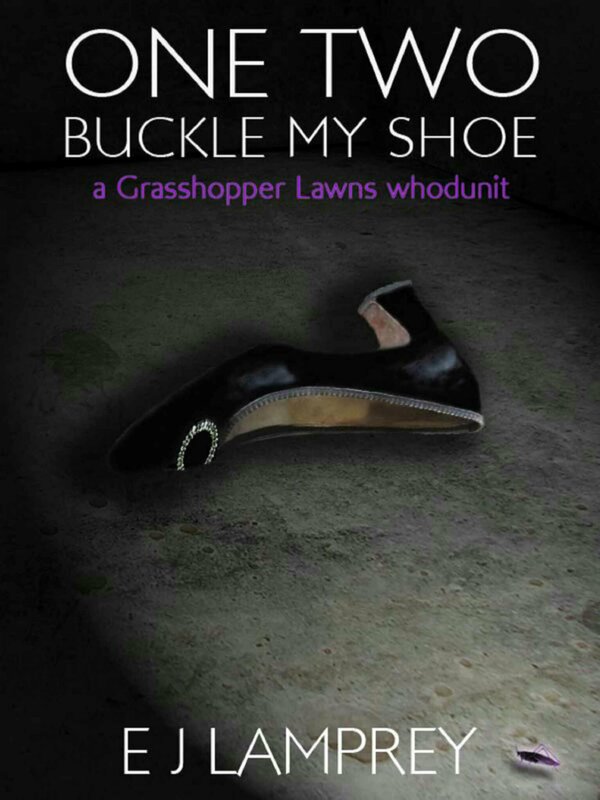 In One Two Buckle My Shoe the engaging Edge and Vivian solved a flurry of murders at Grasshopper Lawns with their new friends Donald and William, but life has now settled back to normal; as normal as it can be in this particular Scottish retirement village, where residents are chosen for their interesting histories. Vivian and William are relishing their lively flirtation, there’s a new resident with a dreadful dog, and Sylvia is enjoying the visit of a devoted and handsome nephew. Even the death of a young and pretty Nigerian girl doesn’t seem to need the murder-solving talents of the four friends, as it was so obviously a suicide. The most exotic visitor is the enigmatic Dallas from Louisiana, with life-changing news for Vivian; but when Death makes a personal call, events take a more sinister turn. In crayon – all my drawings had a story. I wrote my first story at nine, and cut up my mother’s magazines to illustrate it, she wasn’t impressed. I enjoy reading them, but it took me ages to try one, now it is my favourite writing. Plotting a murder is like doing a jigsaw, I work out ‘whodunit’, then write the puzzle pieces to hide the picture for as long as possible. I’d love to not have to work, so retirement for me beckons like a bright light, but for many it can be lonely. Perfect world would be an affordable retirement village, interesting neighbours, lots going on but total independence, something stimulating (like murder) to accelerate friendships … idle thoughts that just grew. I wish I could say they were interested now, marketing would be so much easier. 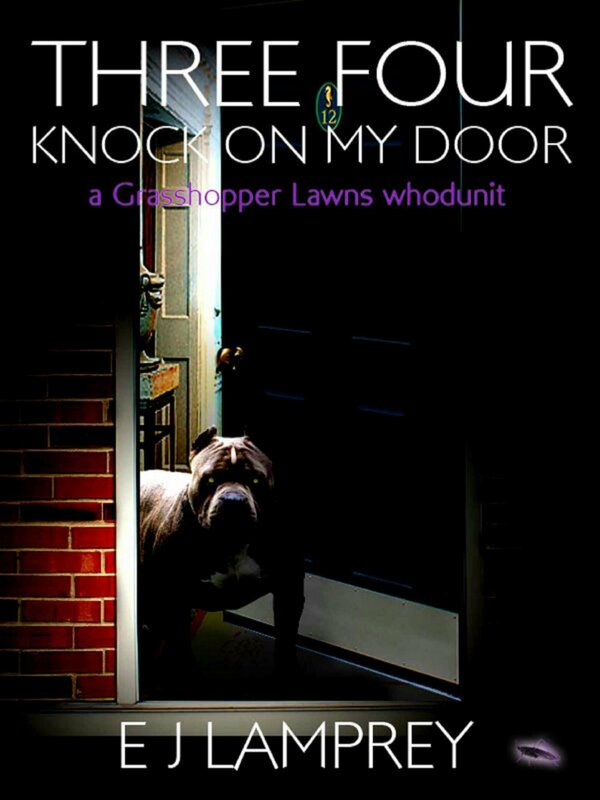 I do have an agent for earlier books, but the Grasshopper Lawns ones have never been submitted to a publisher, because novellas are not a commercially-popular length. I like the total control of self-publishing, but professional input would be great. Independent publishing is so new, I think soon there will be professional quality marketing experts and agents who will choose books they believe in to work on, I hope so. Being chosen by a really good promoter would open doors that just aren’t open to an individual. Thank you! Probably Donald, he was chilly and remote at first but I like him more with every book. With the others, what you see is what you get, Donald has layers. And I really like Kirsty, she’s got so much future, the others are slowly winding down and she’s powering up, with her whole life ahead of her. Five Six, without a doubt. It was such fun to write! That’s Sue Grafton’s influence, with her alphabet murders. I liked the idea of a series with a clue to even a minor theme in each title, and this rhyme was ideal, even gave me ideas, for every book except Seven Eight. I’ve had to cheat a bit with that – the working title is Seven Eight Play Them Straight. 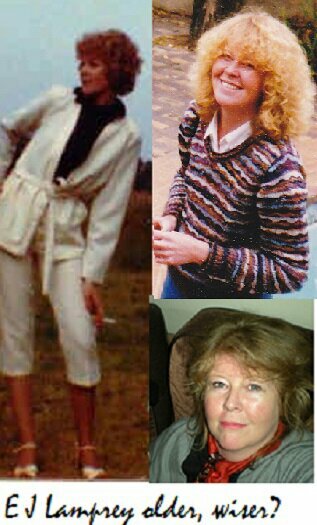 Vivian Oliver is very loosely based on a real person I’d known all my life, it’s really handy to have another voice to call on sometimes when you’re trying to think what a character would say in a certain situation. Donald is even more loosely based on a good friend I had years ago, who was a set designer and used to get us house tickets for opera. (I don’t much care for opera but opening nights, once in a while, can be fun.) William was originally a disreputable older man who used a zimmer, but a large friend of mine uses two walking sticks and I ‘borrowed’ those and made William younger, more in line with the others. Some of our mutual friends are convinced William borrows more than the sticks! That’s been quite restricting, I have to be careful what I write about William as a result, so I wish I hadn’t done it but too late now. Lesson for next time. Yes and no. What they say and do comes from me, so there must be some crossover, but sometimes I read something back and wonder where on earth it came from! Kirsty has a boyfriend now that I like, I think Drew will stay around. I’ve pencilled in Kirsty getting engaged / married in Thirteen Fourteen, and I’m pretty sure there’ll be a baby in Seventeen Eighteen, just because it works so well with the titles. Whether she’ll still be with the police, or have branched out in some other direction, no idea yet. She is the only character with a real future, at an age where her life could change completely at least once. There are some truly brilliant Scottish Crime Fiction writers who will always dominate the genre. I’d be happy to appeal to readers who like cosy whodunits and enjoy the Scottish setting, I accept it will never be a best-seller format. I was surprised that my books sell best in the US until I read that there are upwards of fifty million people worldwide with a Scottish heritage, that’s a lot of us with a proud dash of tartan blood. Beta readers. The more, the better. It’s so easy, when you’re setting up and solving murders, to leave gaps in the plot without even noticing, my pre-publication readers ask what happened to so-and-so, or why I raised a red herring but then left it dangling, and of course they’re trying to solve the murder before the characters do, so they’re really quickly onto anything that wasn’t tidied up properly. It can be a bit bruising, but they are worth their weight in gold. I am always looking for more, especially new ones who don’t know the series so can really feed back on whether the latest book can be read on its own (and I am happy to pre-read for another writer in return). The first few happened by luck, friends without Kindles who wanted to read One Two and gave such useful feedback that I sent the Three Four manuscript to them before publication. I’ve got other stuff out under another name, and have (different) beta readers there too. Five Six was the first time I actually asked for more readers (through LinkedIn) and I hope to have at least eight for Seven Eight when it reaches reading stage. I can’t recommend beta reading enough, especially for an independent writer. I do have a very good editor but editing is a different agenda, she’ll check my writing but not my logic, a reader’s viewpoint, even when it isn’t necessarily what you expected to hear, is priceless. There’s been a murder, how great is that for a blog title? And it’s a grand blog, Lynsey really knows her stuff!